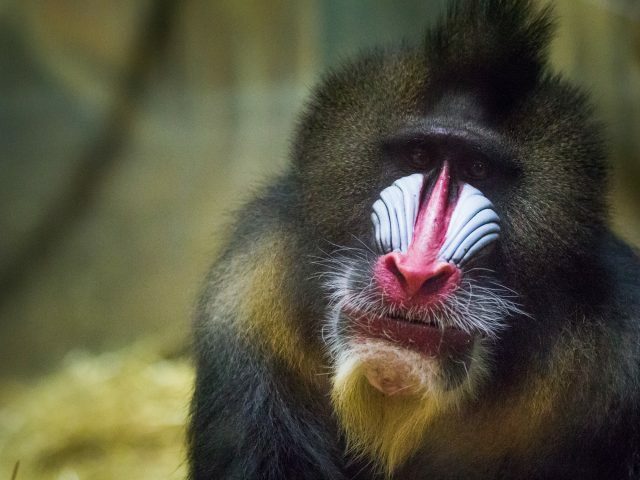 The mandrill is stout-bodied with a short non-prehensile tail, prominent brow ridges, and small, close-set, sunken eyes. The ribbed bare skin on the adult male’s cheeks is bright blue, with scarlet on the nose, with the beard and neck a yellowish color. The buttock pads are pink to crimson, shading to bluish. There is a pronounced difference between the sexes, with females being duller in color and noticeably smaller. Males are also known for their long canines. All have an “ischial callosity” or sitting pad on the rump, which provides a comfortable cushion on the forest floor. 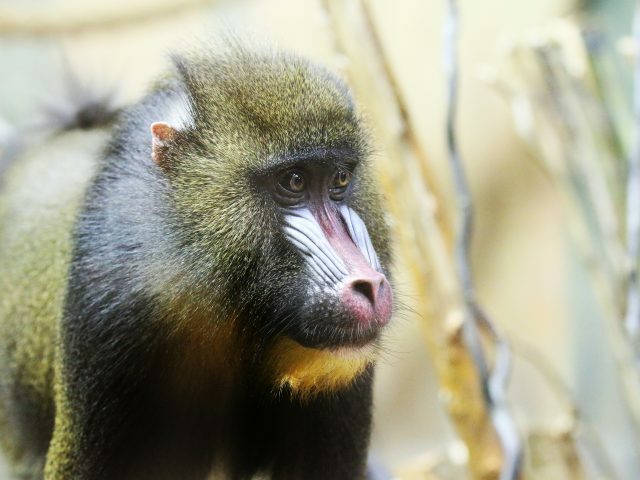 Mandrills live in troops of about 20, dominated by a single older male. The young are tolerated until they reach a certain age when the dominant male begins to instruct the young on proper mandrill behavior. Mother-daughter bonds last into adulthood; maternal bonds with sons last until sexual maturity, when juvenile males leave their natal group, often form bachelor troops and raiding other troops for females or challenging the dominant male in a group in a takeover attempt. The dominant male will control the troop with aggressive behaviors, such as raised eyebrows, ground slapping, and exposing his large canines. The group’s subordinates respond with submissive behaviors, such as repeated sideways glancing, cowering or crouching, or grimacing. 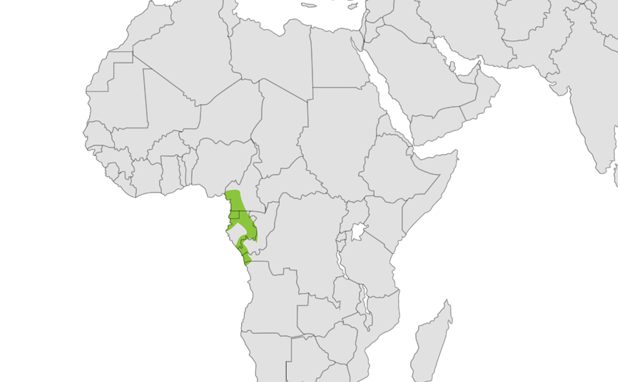 Mandrills are also known as the forest baboon. 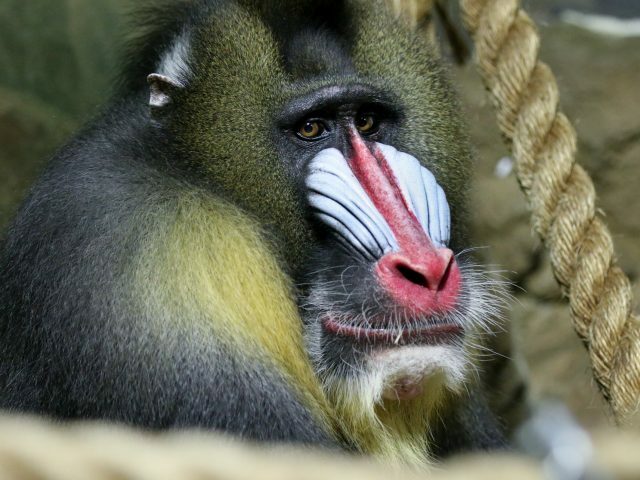 Rafiki from “The Lion King” is a mandrill, although he is referred to as a baboon. Their cheeks have built-in pouches that are used to store snacks for later consumption. 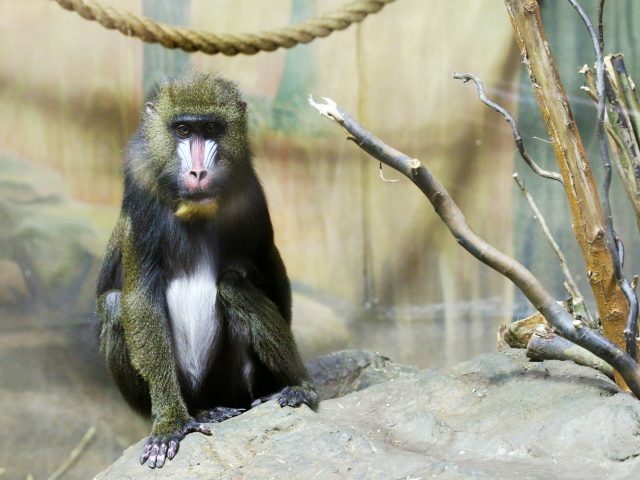 We have 2 mandrills here at Potter Park Zoo, our male Loko and our female Susannah. 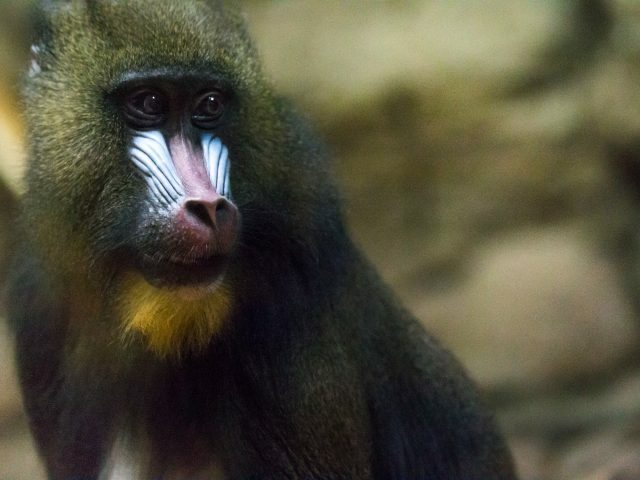 The male mandrill is around 3 feet in length, and weighs up to 55 pounds. The female is much smaller at 2 feet in length, and almost 30 pounds lighter. Fruit, leaves, seeds, nuts, shoots, arthropods, crabs, fish, small vertebrates, and cultivated crops.